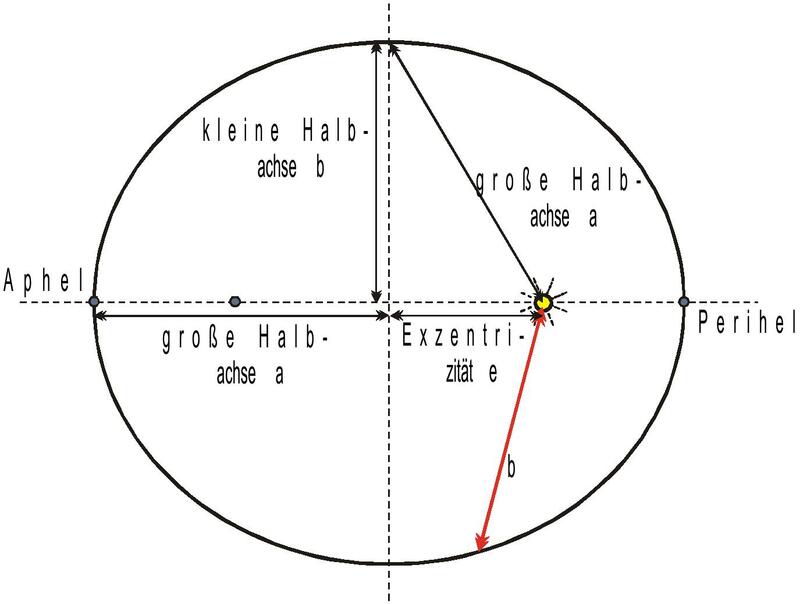 This is one of the first realisations of a harmony of the spheres / music of the spheres according to the methods and discoveries of Hartmut Warm (Keplerstern Verlag – Hamburg). 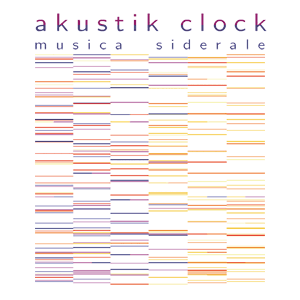 This extraordinary track represents 1000 years of astronomical data in fast motion respectively 12 hours. The sound is from a virtual synthesizer and each (earthyear – 1.1.) is also marked with a beat of a kettledrum. About 2500 years ago Pythagoras founded the idea of the harmony of domains. At the beginning of the 17th century Johannes Kepler gave this idea crucial new impulses. Kepler discovered the elementary laws of motion. In 1619 Kepler published „Harmony of the world“ („Weltharmonik“). He described among other things that parallel musical intervals are echo orbit. Several years ago Hartmut Warm wondered what to really expect from Kepler’s „Harmony ot the world“ and that in the setting of modern astronomic and mathematic methods. Warm realized neither in Kepler’s allocation nor other in literature described models of music of speres is there a better approach resulting in pure coincidental distribution. He also discovered where there is a statistically highly sophisticated accordance. This and a great many other discoveries have been published in his book „Signature of domains – of the regularity in the solar system“. 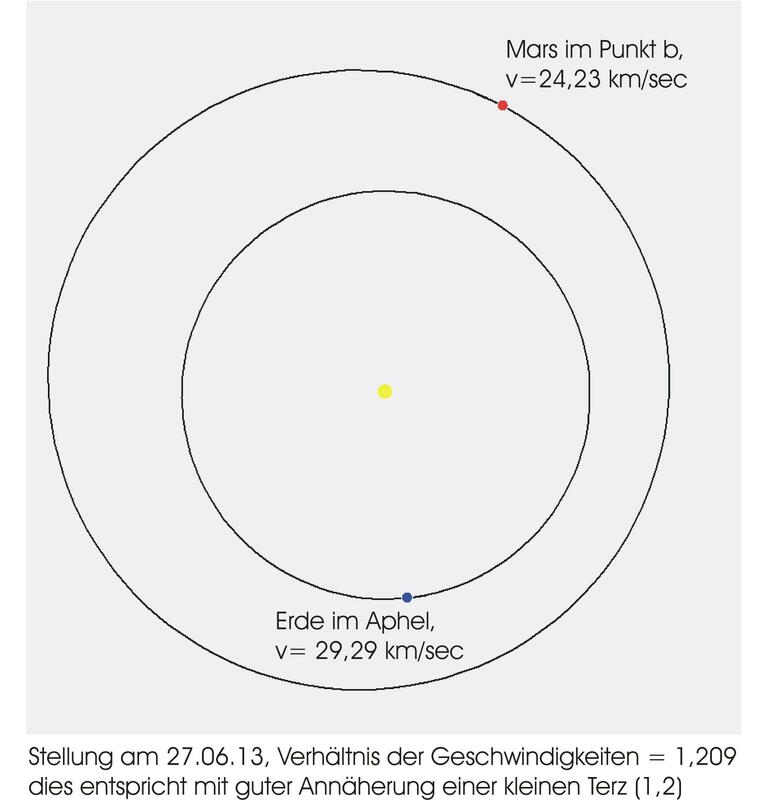 In a planet’s circulation in orbit it changes velocity constantly, so Kepler in his 2. law of planets. At its Aphelion velocity is at a low, at its Perihelion it is at its peak. 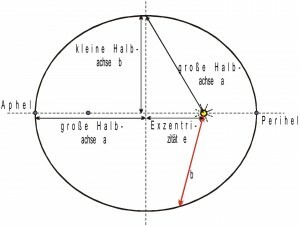 On its orbit there is furthermore a point where a planet has exactly the distance to the sun in his semi-axis (see point b). Since the orbit is symmetric this point exists twice. 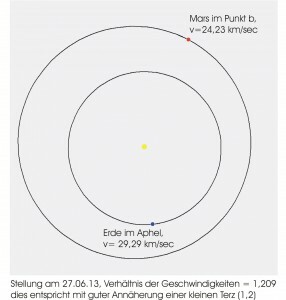 If the velocity for all nine planets ( Pluto included) is calculated and put into relation with Aphel there is without exception conformity with musical intervals. With the highest probability – a rate of 99,9% – it appears to be no chance result, providing appropriate statistical methods. The two and a half thousand years old conception of sphere’s harmony – and Kepler’s fundamental ideas – hence found confirmation for the first time ever. The planets effective velocity is as described in accordance with the musical intervals – if they are at point b or in Aphelios. 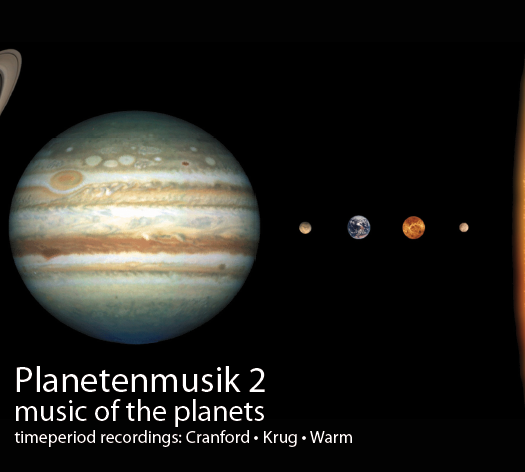 You can imagine an instrument that sounds off exactly when two planets reach this point on their solar orbit. This offers a great many possibilities. Sometimes there a longer intermissions, sometimes they sound off simultaneously. The planets are in a way playing a chord. All constellations can be verified with a computer. This leads to a tonal sound according to this method. In doing so a detection limit of 4.2 degrees was taken as basis. That means it sounds off if 2 planets are simultaneously at a maximum of 4,2 degrees distance to one of the above mentioned points (the smaller the limit is, the events are all the more rare. Is the result bigger it is „off resonance“, that means a compromise has to found). Data discovered that way delivers raw material – that is consecutive numbers of „musical events“ and in the process occuring velocity and its periods – and can be transcribed into audible music.